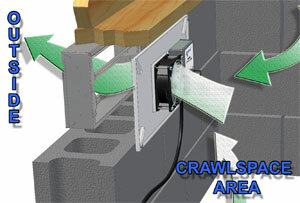 Powered Crawlspace Vent (Model PCV1) creates a powered ventilation system for crawlspaces that can be utilized in both old and new construction. 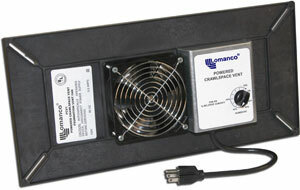 The PCV1 is designed to be mounted behind any new or existing crawlspace vent. Its operation is controlled with a temperature switch /humidistat control which activates the motor at or above 50ºF and is user adjustable for the varying levels of relative humidity in your crawlspace. By incorporating the PCV1 into your homes crawlspace ventilation system, you can help stop mold growth, mildew, rot, pest /insect infestation and decrease high humidity levels while increasing the overall airflow within your foundation. To aid natural crawlspace ventilation, mechanical ventilation should exchange the crawlspace air at least four times an hour or every 15 minutes. To determine this, multiply the square footage of the crawlspace by the height to calculate the cubit feet of the crawlspace and then divide by 15 to determine the CFM needed. Home with 1500 square foot crawlspace 2 feet tall. Each Fan provides 110 CFM so one should use two(2) PCV1s. Great job guys, products that work great at a great price.